Custom cut sealing gaskets block light, air, weather and moisture from invading the interior of the vehicle and living space. Butyl and foam gaskets are clean and convenient, reducing the need for messy silicone caulk and other liquid sealants so you can keep production moving without the cleanup. 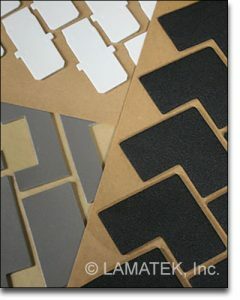 Rubber-based or acrylic adhesive is available on almost all sealing substrates. LAMATEK sealing gaskets are kiss cut on a roll for your convenience and then packaged in cartons. Custom gaskets reduce assembly time and eliminate cumbersome production processes that typically involve messy liquid sealants and time-consuming cleanups. Not to mention the uneven globs, additional tools and unpleasant odors. The only thing you have to do after using our gaskets is throw away the liner and move on to the next job.